Obituary for Catherine Nana Farley | E.F. Boyd & Son, Inc.
Catherine Nana Farley, affectionately known as "sister," was born to Malcolm and Margaret Boswell in Cleveland, Ohio on June 14, 1930. She was one of eight children. She was preceded in death by her husband John, brothers Theodore, Irving, Douglas, Robin and sister Marguerite. 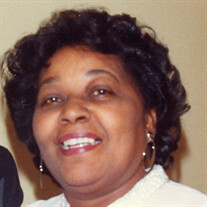 Catherine attended Cleveland Public Schools and graduated from Central High School in 1948. After graduation Catherine began working in the Central neighborhood. In 1951, Catherine met the man who was later to be her husband of 48 years; John Farley, while she was working at Rexall Drug Store. From this union three sons, Khalid, Michael and Stephen were born. Catherine is quoted by her grandchild as being the "greatest grandmother ever." She doted and adored her grandchildren and created a safe space for them to learn and grow in her home. As children, the girls would ask if they could go to "Grandma's Preschool." As many of her grandchildren's first teacher, she taught them how to write, read and love nature. She was an avid gardener who loved being surrounded by colorful flowers while calling and listening to the birds from her porch. Catherine loved to draw, watch sports and listen to opera, Nat King Cole and the Temptations. Catherine was proud of her offspring. She never missed a graduation, she traveled across the country to celebrate every milestone. She hosted birthday celebrations and bbq's in her backyard. Catherine also loved supporting her grandchildren's education and was actively involved in the school PTA, Cub & Boy Scouts, athletic programs, block clubs and church. She joined Elim Baptist Church and was baptized at an early age. She is survived by her sons, her brother, Malcolm Boswell, sisters Donna Connor and Mary Martin (David) and a host of grandchildren, great grandchildren, nieces, nephews and extended family and friends.